Splash Mountain is a ride that has captured people’s hearts and their tummies for years, so who doesn’t want to know a few more interesting facts about this Disney Fanatics favorite? 1. 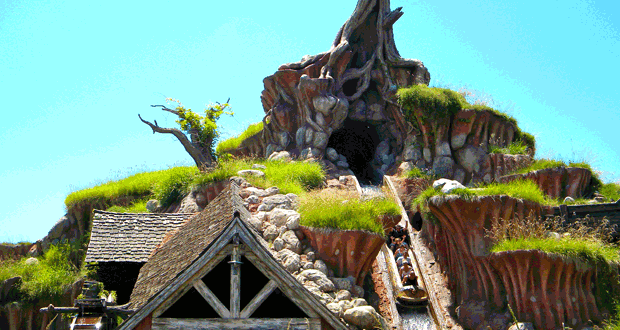 How many gallons of water does Splash Mountain hold? Have you ever wondered how much water is flowing through your favorite flume ride? If you guessed 965,000 gallons of water you’d be correct, and we’d be impressed. So next time your swishing through your adventure at the Briar Patch, just remember how much it really takes to zip you through this attraction. When it comes to Disney royalty, Tony Baxter is very far in the ranks. He is the former Senior Vice President of creative development in Walt Disney Imagineering and is responsible for famous attractions all over the world, including Big Thunder Mountain, Star Tours, and Journey into Imagination. The idea actually came to Tony while he was sitting in traffic! Let’s all take a moment to give thanks for bad traffic so all of us Disney Fanatics can enjoy this ride every time we’re in Disney. The name makes sense, right? Even though the name was great during the development of “Zip-a-Dee River Run”, a new Disney movie was about to be released. Anyone remember “Splash”, the movie about a mermaid with Tom Hanks? Former CEO Michael Eisner thought naming the ride “Splash Mountain” would be great promotion for the movie. The movie was promoted in a creative way and the name “Splash Mountain” stuck. 4. Your last plunge into the Briar Patch is a fifty-two and a half foot drop. Yikes, that’s high! You also gain speeds of over 40 miles per hour on your way down. No wonder I always cover my eyes in excited fright. If you talk to lots of Disney Fanatics they’ll tell you one of the best times to ride Splash Mountain is at night; if you can time it well, go during Wishes. The lines will be down and when you reach the top of the Briar Patch you get a spectacular view and a thrill. True to Disney style, Splash Mountain has 68 dancing critters to entertain you as you follow Brer Rabbit on his journey. My favorite audio-animatronics are the turtles that are giggling and playing in the water in the “Laughing Place” scene. If you recognized the voice of Brer Rabbit, you have a reason to. The same voice talent that gave us Wakko Warner on “Animaniacs” gave us the very distinct and hilarious voice of Brer Fox. A hidden treasure of Splash Mountain is all of the critter homes that have animal noises coming from them. You’ll catch yourself feeling like you really are in Briar Patch and all your furry friends are having conversations around you from their homes. I’ll never forget as a kid waiting in the long Splash Mountain line and turning to see one of my favorite line queue scenes to this day. If you peer through the small wooden window you’ll see Brer Frog rocking back and fourth and he seems to be telling a story by a fireplace. Disney Imagineers are known for putting in their own little hidden treasures, and if you listen closely you can hear one small animal exclaim where an Imagineer graduated from college. Just as you are about to climb up the hill for the last big drop look up and watch for a tiny animal to pop out. To an unsuspecting ear, it might sound like a sneeze, but if you listen close enough, you can hear the “F-S-U”. If you aren’t going to be in Disney World and are still dying to know if this is true, there are many Disney fans that have captured the little critter on video and have posted it on YouTube. Take a look; it is fascinating! Who doesn’t love the grand finale of Splash Mountain? It’s a magnificent scene featuring lots of singing critters celebrating their “Zip-a-dee-doo-dah” day! Did you know that the large boat in that scene stands 22 feet high and is 36 feet wide? Maybe that’s why that scene always captivates me so much. Well, it’s the truth, it’s actual, everything is satisfactual, and we are so happy to have shared some information you might have not known before. We would love to hear your experiences and stories on Splash Mountain. Sound off in the comments below! My name is Madison, I'm 21 years old and currently live in Kentucky. Disney is my passion, research is my hobby, and writing is my "made for this". I have been a big Disney fan ever since I can remember, I loved all the Disney princesses, and I will never forget my first trip to Disney World when I was seven years old. It wasn't until my husband and I took our "Disney Honeymoon" that I was REALLY hooked. In June we will have taken our third trip to Disney in less than a year and have many more planned in the future! I am a big pin trader, my favorite princess is Sleeping Beauty, and the Wishes Fireworks Show brings me to tears every time.